Ukrainian Jewish Heritage is a series that has been ongoing here at Nash Holos for several years now, sponsored by the Ukrainian Jewish Encounter of Toronto. 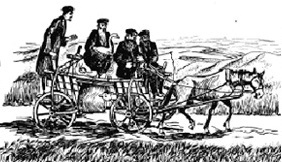 The series … for me and also, I hope, for Nash Holos listeners … has opened a window into the fascinating, centuries-old yet little known, history of Jewish life in Ukraine. It has also presented opportunities for dialogue between people of Ukrainian and Jewish descent who are working to make this history better known. Recently I received an email from Allison Zivin of the Felshtin Society in New York. The Felshtin society is named after a Ukrainian town called Felshtin, which today is called Hvardiyske. It began as a benevolent society organized in 1905 in New York City. 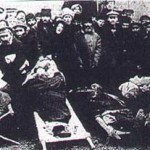 After a brutal pogrom in February of 1919, in which some 600 Jewish Felshtiners were massacred, the society provided refuge and relief to the survivors. A hundred years later the Felshtin society is still active and is planning commemorative events to mark the centenary of this tragic historical event. 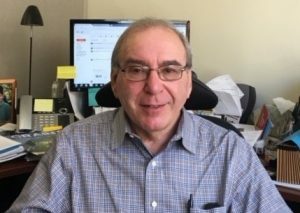 On the line to tell us more about them, the society and the history behind it is the president of the Felshtin Society, Alan Bernstein. Pawlina: Alan, welcome to Nash Holos! Alan Bernstein: Thanks very much, Pawlina. Pawlina: It’s great to find out about this story and about your society. I had no idea about it! So tell us a bit about the Felshtin Society. Alan Bernstein: The Felshtin Society was begun in 1905 and it was known as a Landsmanshaftn organization which was formed to provide fraternal and other support to people who came from Ukraine, from this part of Ukraine, and they got together as a group of neighbours and a group of family and other connections, business connections, and formed organizations to help themselves manage in the New World and also to have the opportunity to purchase burial plots because there were no cemeteries available to many of the immigrants who came from eastern Europe at that time. So there were many reasons why these societies were formed, but those were the primary goals. Pawlina: And so in 1919 when these horrible pogroms started this was an added service the society provided? Alan: Yes there were additional things… Once the pogroms occurred many of the people who were part of the society at that time became very active in providing relief to the people who had survived the pogrom. They were very active in establishing orphanages for the children who were left without parents, in a variety of different places in eastern Europe. In Proskurov, a town that is now called Khmelnitsky, and other places where there were groups of children that were left alone. So there was a tremendous amount of relief effort that got carried on after 1919 by our society as well as many others that were formed from the many other towns—more than 1200 towns—that were affected by these events. lina: And they were horrific events. A lot of people got killed and the world doesn’t know about this very much. Allison told me that your society is working hard to commemorate this event because it’s the centenary coming up next year. So would you tell us a bit about the events that are coming up? Alan: Well it’s true that these topics are not as popularly discussed as the Holocaust, and the Armenian genocide and many of the other terrible things that unfortunately man does to man. So we have decided several years ago, probably about six years ago we started working on this and thinking that the hundredth anniversary of the pogrom was an important date that we should memorialize and try to use as an opportunity to shine some light on these events in history, not only for our town but for the more than 1200 other towns that were affected by these events. And the more than 200,000 people that were slaughtered in these years. Because these events did take place over a period of several years. So in our thinking about it, as we have done, we decided that we wanted to have a major event, a day-long conference-type event that would provide people with an opportunity to hear about the historical context in which these pogroms took place. We’re going to talk about the concept of the intergenerational transmission of trauma, and we’re going to also present information about Jewish geneology and having an opportunity for people to talk about how to establish family trees. Because when people go through these kinds of horrible situations, often family history and family roots are terribly disrupted. So part of what we feel our mission is, is to help people reconnect with their roots and try to find their way toward rediscovering their ancestors and having a better sense of where they came from, because many people have really not given adequate attention, in my opinion, to where they came from. It never fails to amaze me that practically whoever I run into … I live in New York … and practically whoever I run into in New York and I tell them about our society or talk to them about what our plans are for the centennial event they say: “Oh you know what, I have a relative that came from there!” or “My husband has people who came from that town.” And I ask them what the town was and they say “I don’t know!” So it’s something that we really took to heart and began to take very seriously. And since we had a group that was relatively intact—we have 250 members in our society—we felt that it was important for us to help other groups reconnect in the way that we were reconnecting with our past. Pawlina: That’s certainly an admirable thing to do because people don’t know about this and even descendants don’t know about this. I think I had a vague recollection of it, and most people do, from Fiddler on the Roof. The story of that shtetl and people leaving it because of the pogrom. And it wasn’t just people coming in and smashing up their homes. It was actual wholesale slaughter and it happened in more than one village. And there are no more shtetls in Ukraine, are there? I mean, Felshtin really is kind of the story of the disappearance, and extinction, really, of the shtetl in Ukraine. Isn’t it? Alan: Well we went back to the town in 2010 because our group erected a monument both for the victims of the pogrom and for the victims of the Holocaust, because as it turned out, although there were 600 of our people slaughtered in 1919, when the Nazis came in and the Holocaust took place, they unfortunately slaughtered the rest of the Jews that were living in the town at that time. So there were two purposes, and we have a monument that’s now standing that both pays tribute to the people that were killed in the pogrom as well as the people who were killed in the Holocaust. So the town itself is a rural town. It’s a farming town and people are still using horses and buggies, and it’s probably still very much like it was in many respects 100 years ago probably, with a few light bulbs and TVs. But the town and its character still remain relatively intact, but certainly without the Jewish element. There are no Jews in that particular town. Pawlina: That’s so tragic. Because the history would probably have gone back centuries. Alan: Yes, that’s very true. Pawlina: So you’ve got this commemorative event, a full-day conference coming up. And Allison mentioned that you have another program called “Who Will Light a Candle?” What’s that all about? Alan: Well we’re a very small group; I’d say our labour capacity is very limited. But we had this idea that one of the things that would really offer us an opportunity to expose people to this idea and the ideas of these events in the past. One of the things that we thought was a good idea would be if we could get people involved in lighting candles. So as part of our centennial memorial we are asking people anywhere really—and of any persuasion, really—to light a candle for one of the people who died. And we’re hoping to be able to have 200 thousand candles lit, one for each of the people that died. That was one of the ideas that we had. We’re also in the process of reaching out to all the synagogues in the United States and Canada, actually, if we can get to it. But as I indicated, our labour pool is relatively limited, so we’re doing the best we can. But we hope to contact every synagogue in the United States and help them understand that we think it’s important to reach out to their congregants and find out who among their congregants might be connected to these events in history, and how they might be able to establish a day of mourning in their synagogue, so that those people who do have family that came from that part of the world and who may have suffered would have an opportunity to say the Jewish prayer for the dead, which is the Kaddish. And then hopefully also light a candle. In addition, we’re also beginning an effort to have a national day of remembrance. We’ll either work through the government or we’ll work though… actually we’re trying to reach out to the Ukrainian government as well, that we can have a national day of remembrance that would gain some attention publicly. The whole idea is that we would like very much to acknowledge these events; we’d like very much for people to become aware of these events that took place, to remember the people that perished and to try to shine a light of sanity in a world where it doesn’t seem like the value of human life is increasing. It seems to be more and more that with the tide turning against immigrants and now we have a world of 65 million immigrants and what’s going to happen to those people? You know so much of what we able to benefit from, because our families were welcomed and our families had families here that could support them and provide jobs and housing and things like that. And those opportunities seem to be in much less favour than they have been. Pawlina: Yeah, humanity does tend to peak and valley, doesn’t it? Well let’s hope that it improves and that what you’re doing will help to make people think as well as remember and apply lessons of the past to the present, so that there is a better future for everyone. The day that you’ll be lighting the candle, and the National Day of Remembrance, will that be the same day by any chance? And what day on the calendar is it? Alan: You know, Pawlina, it’s an interesting question and some people have brought it up to us because these events took place over time. They took place over years. So Feb. 16, 2019 is the date for Felshtin. But for instance, our neighbouring town, which is Proskurov (now called Khmelnitsky), that pogrom took place three days earlier. So according to Jewish law, it’s supposed to be on a particular day. And we don’t want to dictate that it should just be on February 16th. We’re hoping that the synagogues will recognize and help their congregants discover their roots and pick the date that they feel is most comfortable for them in the individual synagogues that we’re reaching out to, to establish a day of mourning. In terms of a national day, we’re open. We feel that whatever day we can get established would be fine. Because as I said, there’s such a broad range of dates in which these events took place. So we’re not quibbling over details in this. Whatever date they assign us we’re happy to take. Pawlina: Yes well with the government generally you are! Alan: Exactly! There you go. Pretty realistic. Pawlina: So just to clarify then, the 200 thousand candles that you would like lit, would that be on one day or spread out then? Alan: You know, we’re happy to get 200 thousand candles lit. According to Jewish tradition, it should be on the day that people perished, that people passed away. It should be on those days. So somebody from Proskurov would light a candle on February 12th. We’re going to do it on February 16th. We’re not going to quibble on details. The idea is to inspire people to remember those who perished and to hold their memories in their hearts for that day. We’re really not concerned about which day it is. Pawlina: What do you recommend for people that aren’t Jewish or didn’t have relatives who perished but would like to light a candle in solidarity? Do you have any suggestions or requests? Alan: Yes we’re happy to have them join us at the Felshtin Society and light their candles on February 16th. Alan: That would be wonderful. And we’re hoping that people of all faiths and all walks of life would be joining us and sending us their support and contacting their clergy people and helping them (their clergy people) understand the significance of this and why they, as congregants of any faith, would like to to participate in this. Pawlina: Indeed. So, any time of day? Alan: In the evening. Generally these candles are lit in the evening. Typically a yahrzeit candle, which is the Jewish name for a memorial candle, is a 24-hour candle and it’s lit in the evening. The prayer is said at sundown, and that’s when the candle is lit. Pawlina: Okay, so for those who don’t know the prayer, I guess any prayer? Alan: Any prayer will do. Pawlina: Well unfortunately we’re running out of time. There’s so many more questions I wanted to ask you about the Felshtin Society. But there was one more thing: the survivors of the Felshtin massacres started to record their experiences into a book. Tell us about the Yizkor book. Depression, to provide grants to people to do a variety of different things. In many cases they did wonderful art work, and in other cases they did other things. But the one thing that we got was a grant to write a Yizkor book. The book consists of three parts. It tells stories about the town, about the shtetl. And then it tells stories about the horrors of the pogrom—and there are a lot of eye witness accounts from people who barely escaped with their lives, people who have a lot of stories about those who didn’t escape, and who was a victim. And then there are many stories about how people got to the United States and how they established themselves and how the Society functioned, and about different kinds of internal political debates in the Society itself. It was kind of a history of the Society. That book was published in 1937. We’re just in the process of a final revision of the translation that was done about 10 years ago, and probably by the end of the year we’ll have it published in a new form and with new binding—you know, a beautiful new publication. Pawlina: And that will be really useful for anybody—it will be a window back in time, because it was written so long ago, when memories were fresh. I think it will be quite an eye-opener for anyone that wants to read it. So where can people find out more? You have a website so tell us where people can find you and what’s on your website. Alan: We have a website, our website is www.felshtin.org. We have a lot of things on the website. We have bibliographical material, we have biographical material, we have names of people who perished in the pogrom, we have a whole series of interviews that we’ve done—oral histories of people who are first generation Americans who have seen their families evolve from their parents who were immigrants to the present day. We’ve got about six or seven different oral histories that depict what it took for these families to make it in the United States. And it’s just chock full of all the historical documents that we could get our hands on at this point. A lot of first-person stories that aren’t in the book, a lot of news articles about Felshtin and about the things that happened subsequent to the pogroms and up into recent times when we’ve had the opportunity to do things that got published in local newspapers and other periodicals. So we’re very happy with our website. We think it’s great. Pawlina: Yeah I do too, actually! I visited it and there’s lots of stuff there. I could spend a lot of time there and I will! Pawlina: And so there will be information there as well about your upcoming events, for anybody that is listening from New York, or is planning to visit. Or would like to make a special trip to do that. The whole concept, and the one thing that really fascinates me, Alan, is the intergenerational trauma. You know, maybe finally, this is a point in history where we will look forward. I can just imagine, all the people that came after all the pogroms, after the world wars, and now as well, fleeing from wars. We just expect people to come in and just pick up and learn our customs and fit into society and carry on, as if nothing happened. And there is incredible psychological and possibly physical damage to these people and we just kind of push it under the rug and don’t deal with it. And I think it’s something that needs to be dealt with. Alan: I think you’re absolutely right, Pawlina. I don’t think there is any question about it. I think the world is looking at 65 million souls who are currently bereft of homes, jobs, education…children who are hungry. This is a major problem for humanity and I think it’s something that we have to face. And I hope that with our little group, kind of a David and Goliath story here, but we hope that with our little group that we can at least shine a little bit of light on what it took for us to establish ourselves and become part of a decent society, and what it will take for the world to set itself straight another hundred years down the road. Pawlina: We can only hope. Well it was wonderful to have you on the show and to meet up with you. And we’ll be bringing more information to our listeners about your events and your society. In the meantime, people can go to your website and learn more about it and keep up to date. I imagine there will be updates when things are all finalized. So looking forward to that, Alan. Alan: Well thank you very much for the opportunity to talk, Pawlina. It’s very wonderful that you’ve allowed us to do this and I think it’s terrific and we’re very happy about it. Pawlina: Well same here and thank you again. We’ll talk to you again. Alan: I look forward to it. Take care. Be well. Pawlina: Thank you. You too! We were speaking with Alan Bernstein, President of the Felshtin Society in New York. For more information about the Society, its work and the history of the Jewish community, or shtetl, in Felshtin, visit their website www.felshtin.org. Ukrainian Jewish Heritage is brought to you by The Ukrainian Jewish Encounter based in Toronto, Ontario. To find out more visit them at ukrainianjewishencounter.org and follow them on Facebook and Twitter. For transcripts and audio files of this and earlier broadcasts of Ukrainian Jewish heritage, please, visit the Nash Holos website www.nashholos.com.